Walker Martin has a high opinion of this magazine when it was published by Doubleday. I was curious to find an issue to review, never got one till recently, when I managed to snag a readable copy of the September 1925 issue at the Pulp AdventureCon in November 2017, and this review is the belated result, If the rest of the run has some fiction as good as this one, then it’s a quality magazine. If you’ve read other issues, leave a line in the comments with the names and dates of some stories you remember. What I got is a copy of the British edition, March 1926, which is a reprint of the September 1925 issue, nothing omitted. A great story of pirate treasure, chases, duels and sea battles. The setting of the story is the time just before the American Revolution. The story starts with the teenaged heroine, Jeanette aka Gyp, in stocks for damaging an inn. The hero, Duncan MacClaren, is moved by her plight and convinces the judge to release her into his custody. After releasing her, he discovers that she is under the guardianship of a man, Captain Jordan, who she suspects is a pirate, and who has designs on her inheritance. Before he can take her home to his sister, she is taken away by Captain Jordan, who does not want her out his control. Over the next four years, Duncan rises in the ranks of the British Army, while simultaneously working for the rebel militia. They’re trying to buy some muskets from a smuggler, who turns out to be Captain Jordan. A drunken young Goliath, Lee Carlton, bursts in on the scene of their meeting driving a horse carriage, fights the local blacksmith and wins, tries to fight a bear and gets knocked out. Captain Jordan does not let anyone come to Lee’s assistance, as he has just learnt that Lee is in love with Gyp. Duncan and Gyp take him to the nearest doctor’s, where Captain Jordan provokes a duel with Duncan. Jordan, as you may have figured out by now, wants to marry Gyp both because he loves her, and because he wants her inheritance. He leaves, and after he departs, two longshoremen come in bearing a dying seaman, a man from Jordan’s crew. Gyp and the doctor tend to him, and before dying he tells them that Jordan is indeed a pirate, playing both ends against the middle: as a King’s privateer, he was searching and seizing Colonial vessels; as a smuggler and arms-runner, he was flouting the Crown; and as a pirate he preyed on anyone. The last thing the pirate tells them is the story of Jordan’s treasure, five hundred thousand gold sovereigns, looted from a Crown ship that got separated from their convoy in a storm. A chain of circumstances starting from this set off a race for the treasure. Gyp is kept captive on the pirate’s ship. Jordan is injured, unconscious and nothing restrains his men, who want the treasure for themselves. Another ship with allies of Duncan, Gyp and Lee is racing for the treasure as well. Excellent action filled swashbuckler, with many twists and turns before the ending – sometimes the pirates are ahead, sometimes not. It would make a great Errol Flynn movie. I’d never heard of this author before, but after reading this story he’s on my list of authors to look out for. SINCE I have set myself the task of writing the story of Gyp, and the adventures ashore and at sea which involved me after her advent into my life, it behooves me to hark back to a golden afternoon in 1770 when I rode down a street in Baltimore and came upon her, a scrawny, disheveled girl of fifteen, with raven black locks and blazing black eyes, imprisoned in the stocks. The times were rough, and the taunting shouts of the urchins and drunken louts about her were common enough sounds in those days. But even at a distance something about her aroused my sympathy and even my admiration. Her wrists and ankles were held fast in the stocks so that she sat, defenceless, facing her persecutors. But she was not cowed. Her sharply outlined chin was upflung; her slender body shook like a taut hawser; her swarthy, angular features were rigid with scorn; and she defied the mob with a vocabulary that fairly bristled with vitriolic idioms. I noted other things, too. This dark girl, who might have been Spanish, or French, spoke with a Scotch accent. And, despite appearances, I was somehow convinced that here was no common scullion. Hence I rode to the side of a bailiff who stood, grinning, nearby—little dreaming that my acquaintance with this girl, who attracted me so strangely, was ultimately to pitchfork me into a duel, and place me in peril among some of the bloodthirstiest men who ever put to sea. ‘‘Who is yon girl ?,” I asked the bailiff. I was wearing the uniform of a major in the Royal American Dragoons that day, and he answered me respectfully enough. “Why, Major MacClaren,” said he, “her name’s Jeanette Burns, but she’s so dark, like, they calls her Gyp, sir. She’s in the stocks for makin’ a wreck of Long Tom’s inn.” . “That slender girl?” I cried. “Listen to her if you think she’s not capable of it,” he said, with a smile. 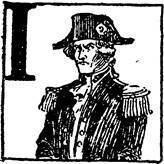 Then he went on to tell me that she was the ward of one Captain Jordan, the commander of a great three-master called the Albemarle a semi-merchant, semi-naval auxiliary vessel, with a privateer’s commission. Billington, a new recruit to the Foreign Legion, is a fish out of water. He is bullied, belittled and treated miserably by his superiors and other soldiers. He gets the nickname “Worm” in his company for being passive and offering no resistance to any mistreatment. He has no friends. The Legion training toughens him physically, if not mentally, and he ends up fighting and knocking out a French Marine named Mousson in a bar. Billington ends up being friends with Mousson for a short while, until Mousson and Billington run into others from Billington’s company in the bar, who make fun of the “Worm”. Mousson disowns him. Billington is filled with rage, and knocks down the Legionnaire who instigated Mousson. It takes a score of Marines to control Billington, and he’s finally subdued with a broken nose and hand. These injuries get Billington admitted to the hospital, and he misses the company’s march to capture Dahomey and oust Behanzin, the ruling king. The other members of Billington’s company think he’s a coward who has found a way of avoiding combat. As they march towards the capital, Abomey, many of the Legionnaires die of disease and some in battle. Only a handful are left when they reach Kana, less than 10 miles from Abomey. Kana is the last stop before the French conquer Abomey, and Behanzin uses most of his army to defend it. Meanwhile, Billington has reached Kana, and gets captured by an Amazon warrior who takes him to Behanzin. Behanzin wants to use a white man as a military adviser, makes a “my money or your life” offer to him. Billington pretends to take the offer, and thinks about how he will have his revenge on all his tormentors – Behanzin, the Amazon warrior, the Legion and Mousson and the Marines. A great story from Newsom, even if he misattributes the French invasion of Dahomey as a response to Behanzin’s brutality against white traders and his own citizens, rather than to French colonialism. As usual, he uses character to drive the plot rather than action. HOW or why Jim Billington came to join the Foreign Legion nobody ever knew. Nobody ever really cared to find out, because he didn’t fit in at all; he didn’t belong in that hard-shelled outfit. At the tail end of a batch of recruits he marched through the gates of the Sidi-bel-Abbes barracks one morning, and was hailed with delight by the old soldiers who gathered about the “ Blues when they lined up before the regimental office. In less than a minute every man in the barrack square was roaring with laughter at Billington. He was so comical, such a freak, and so very much in earnest that even the iron-faced sergeant who was calling the role broke into a smile. He stood at the end of the line, trying very hard to appear erect and soldierly, and there was absolutely nothing soldierly about him. He was short, narrow-shouldered, and as ugly as the proverbial duckling. The suit of clothes he wore was several sizes too large for him; only the tips of his fingers showed below the frayed cuffs of the sleeves, and the pants fell in folds over his worn and dusty shoes. A cracked celluloid collar climbed up about his large ears. He had a thin, rather wistful face, a sensitive mouth and queer, frightened yet determined gray eyes, and an absurd snub nose. And on that face there was a shining, almost radiant light, which might have explained many things to the men who laughed at him if only they had been able to read the purpose behind his eyes. Instead, they jeered and hooted, after the fashion of their kind, and Billington went beet-red from the point of his chin to the roots of his hair, but he looked straight to his front and squared his shoulders a little more. “Hi! ‘Worm,’ when did you crawl_ in here?” one bright wit called out to him. The first part of this story deals with a trial where two cowboys are on trial in the death of a rancher, shot down when he accused them of cheating at cards. The first trial of Jo Kemp results in an acquittal; the trial is a formality because everyone knows his partner shot the rancher. A lady friend of both the cowboys, one they’re both in love with appeals to Jo to do what he can to save the other one, Rufe Pendle. Jo, the senior partner, gets Rufe out of trouble by confessing, and then says that he can’t be touched because to try him again for the same crime would be double jeopardy. The judge reluctantly agrees, the sheriff frees them and warns them to get out of town quickly before a lynch mob forms. The two leave, and are pursued. That’s the good part of the story. Unfortunately, after this promising start it dissolves into sentimental syrup with Jo sacrificing himself for Rufe, who is gutless and brainless to boot, because Jo believes that the woman he loves is in love with Rufe. FOR the following few hours Kemp felt the thrill of the gun duel give way to a period of deadly waiting, of thirst, of torture. The men who had crept in through the mouth of the gorge and were now hiding in the mes-quite made it imperative that Kemp stay on guard with a big boulder of granite as his shield. It was a boulder that radiated heat. The sun blazed down with an increasing ferocity. The whole gorge turned into an oven. Everything shimmered. Kemp’s flask gave out and he was left there to bake, his tongue parched, his eyes dazed, his wound throbbing mercilessly. The sheer hopelessness of his situation without food or water, and weakened by a wound, did not make those long hours of waiting any too cheerful for Kemp. Rather, it led him into philosophizing. What was to happen if he killed off enough of those men? What if he escaped from the gorge into which he had come as a temporary refuge? He had no horse. 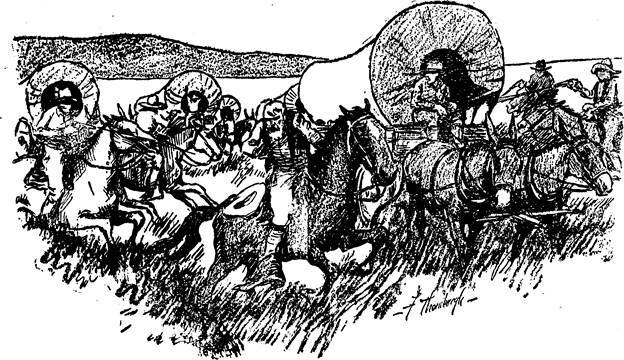 He had shot two men, which meant that the posse would be all the more eager to capture him. Without a horse or provisions his chances of making the border were slim enough. And that last sacrifice he had made—sending his young partner to the Lazy H to win Tess Harmon—was enough to take the heart out of any man. Story is well-written, but the hero of the story is a slave trader trying to protect his human cargo from being confiscated by the American Navy which is trying to stop the trade, and simultaneously fighting another slave trader who tries to take advantage of this distraction by stealing his ship and cargo. I couldn’t bring myself to like the hero. Apparently, readers did, though – this seems to be one in a series of stories that appeared in the magazine from 1924 to 1929. Don’t read – the ending strains the reader’s credulity to the breaking point and beyond (Spoiler: The villain is the heroine’s illegitimate half-brother, this comes to light in the final chapter where he is about to kill her. Her mentally disturbed father takes the villain to be his father, based on a resemblance and chokes him nearly to death before he can harm the heroine.) I wonder how the author thought it would work. Disappointing story that relies heavily on a suspension of disbelief from the reader. On hearing a shot in a room where only two people are present, the villain looks away because he’s been told that there could be a man outside waiting to take a shot at him, rather than toward the noise which comes from near the hero. The fact articles are surprisingly good. Didn’t rate them because I didn’t want to spend time checking factual accuracy, but they are well-written. 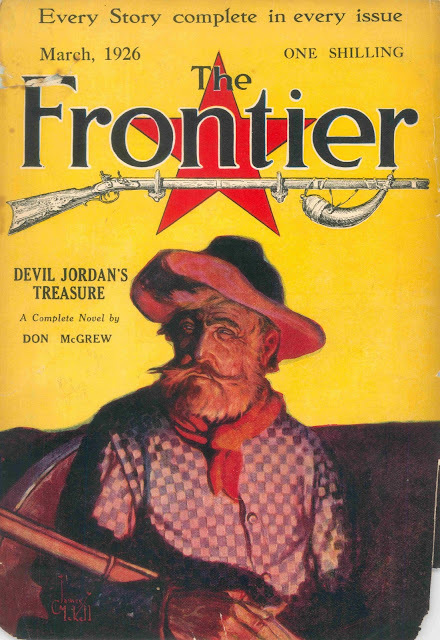 FRONTIER was an excellent magazine but only during the period that it was published by Doubleday, 1924 through 1929. By 1930 the title was sold to another publisher and it lasted for another 20 years but the quality was not the same high standar as when Doubleday published it. In fact, I would same the same for all the Doubleday titles. SHORT STORIES was their main magazine and one of the better adventure pulps for decades. WEST, like FRONTIER, was only excellent during the time that Doubleday was the publisher, 1926 to about 1935. By 1935 the new publisher turned it into just another western fiction magazine. STAR magazine was also quite good but it is very rare and hard to find.